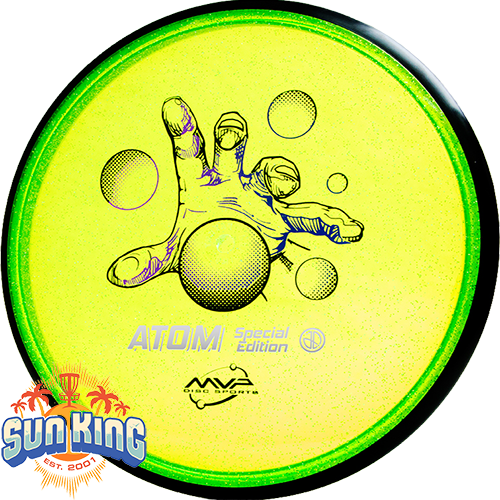 For both high and lower power throwers, the Atom will hold a dependably straight line with a subtle fade. Delve into the quantum realm to reach the Special Edition Proton Atom. This Special Edition Proton Atom, by guest artist John Dorn, features a triple-foil stamp depicting a hand reaching for the nucleus of an atom. Putters make up the nucleus of every disc golf bag, and this beloved throwing putter paired with the special edition stamp celebrates that essential relationship. Explore the heart of the nucleus with the new Special Edition Proton Atom. The Atom's defining flight characteristic is its straight stable flight with a late subtle fade. For both high and lower power throwers, the Atom will hold a dependably straight line with a subtle fade. The Atom's relatively large plate diameter and narrow wing design provide an exceptionally long gliding line. 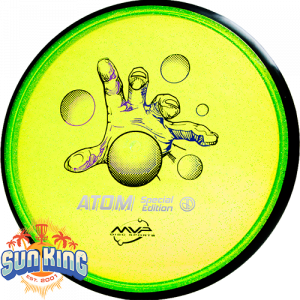 This property combined with the stability neutralizing break in properties of Electron plastic and the flight line locking GYRO™ technology make the Atom a remarkably controllable putter.